Moroso Wheel Studs are manufactured from high-grade SAE 8740 steel to withstand shear loads of 190,000 psi (which exceeds Grade 8 specifications). Moroso Wheel Studs are designed expressly for use with thick-hub racing wheels for both drag and oval track racing. 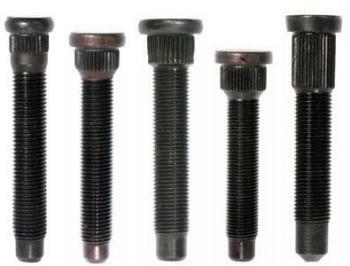 All Moroso Press-In Type Wheel Studs now feature a “quick start dog end” for easier starting of lug nuts. Packed in sets of five. WARNING Do not use any of these wheel studs with wheel spacers!